The miracle of Chanukah revolves around a single-day-supply of olive oil burning for eight days during the rededication of the Holy Temple in Jerusalem (Bet HaMikdash), after Maccabees liberated Israel from the occupation by the Greco-Syrian Seleucid empire. There are countless explanations of the miracle of the oil lasting eight days. The Lubavitcher Rebbe, Rabbi Menachem Mendel Schneerson, offers a unique explanation. The Rebbe dismisses any explanation of the miracle that relies on the miraculous nature of the oil itself. The Rebbe maintains that to be kosher for the Menorah, the oil had to be natural olive oil, not some miraculous oil. According to the Rebbe, the miracle was that the natural oil was burning and not burning at the same time. The Rebbe draws an analogy with the dimensions of the Ark (Aron HaKodesh) in the Holy of Holies (Kodesh HaKodashim). R. Levi teaches that the Ark of the Covenant “had no measure.” (Babilonian Talmud, Tr. Megilla, 10b) The Holy of Holies in the Temple was a perfect cube with 20 cubits in each dimension. Although the Ark itself was 1.5 cubits wide and 2.5 cubits long, the distance from any wall to the wall of the Ark was 10 cubits, as if the Ark did not take up any space. The Talmud describes it as a miracle, a manifestation of revealed Godliness. The Ark of Covenant occupied a place in the Holy of Holies and yet it didn’t take up any space at the same time. The theologians and philosophers say that God is infinite. However, the sages of Kabbalah maintain that to say that God is infinite is to limit God, which we may not do. He cannot be limited even by His limitlessness! The limitless nature of God dictates that God is infinite and “finite,” as it were, at the same time, because He cannot be limited by any limitation or definition. In the language of Kabbalah, God has within Himself both the power of infinitude (ko’ach bli gvul) and the power of finitude (ko’ach hagvul). With respect to the miracle of the oil, this combination of potential infinitude and finitude expressed itself in the oil burning and not burning at the same time. The miracle was that the infinite expressed itself in the finite. In physics, we speak of systems and states. Whereas in classical (Newtonian) physics, a system can be in one state in any given moment in time, in quantum physics, a system can be in a pure state, or in a superposition of states. A Chanukah dreidel (a top) can only spin clockwise OR counterclockwise. In quantum physics, an electron can “spin” clockwise (spin up) and counterclockwise (spin down) at the same time (i.e., have its spin point up and down at the same time), when it is in a superposition of states (spin up and spin down). Similarly, natural olive oil has two pure states: burning and not burning. 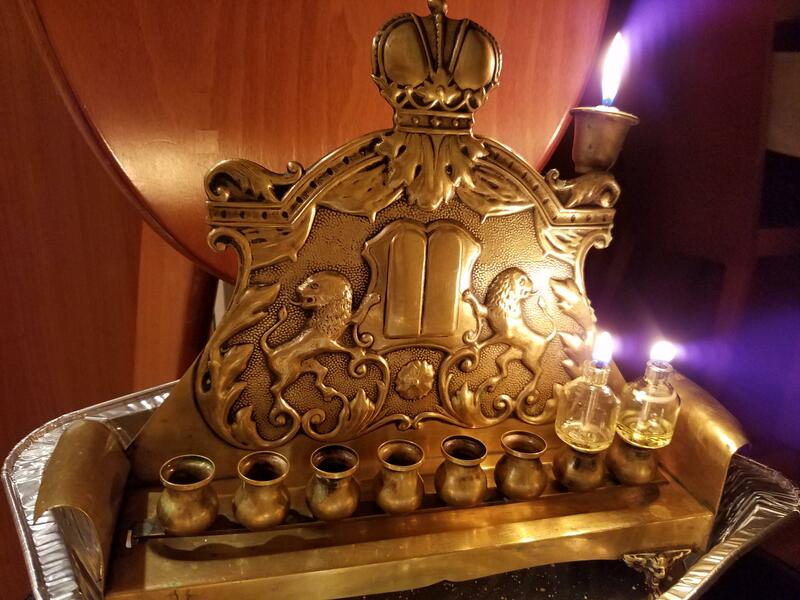 During eight days of Chanukah, the oil was in a state of superposition of these two states, burning and not burning at the same time. My 19-century brass menorah (chanukiya) from Poland has two lions embossed on it. Had I made this menorah, I would have embossed two cats on it—one alive and one dead—and would call it the Schrödinger Menorah. Very interesting – the explanation is scientific and mystical at the same time, a miracle by itself. Thank you!